Fast relief of the discomfort caused by stomach and intestinal gas. Cherry creme flavour. Each chewable tablet contains Simethicone USP 125mg. These taste really good....not quite sure they help with gas though. Great for when you fly and don't have a glass of liquid to take a pill. I'm so glad i bought this! 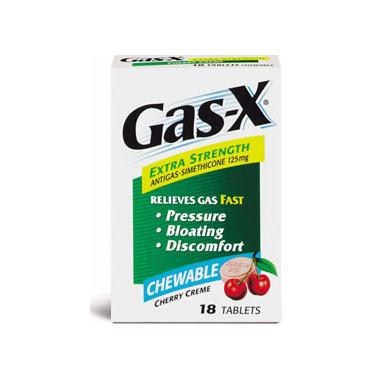 I recently changed to a whole food/dairy free/gluten free/vegetarian diet and found the change made me (temporarily) super gassy. This product tasted great and helped keep the consequences of my dietary change at bay while at work, yay!